Danville, Kentucky (CNN) - Call it a draw. - Read more of today's political news on the CNN Political Ticker. One of the top jobs for the candidates in a vice presidential debate is to convince Americans that they would be able to step into the top job if something happened to the president. The poll indicates that both men were seen as qualified to be president if necessary, by roughly equal numbers. "This poll does not and cannot reflect the views of all Americans. It only represents the views of people who watched the debate and by definition cannot be an indication of how the entire American public will react to Wednesday's debate in the coming days," cautions CNN Polling Director Keating Holland. One-third of the respondents who participated in tonight's survey identified themselves as Republicans, with 31% identifying themselves as Democrats, and 34% identifying themselves as independents. "That indicates that the sample of debate watchers is more Republican than an average of recent CNN polls of all Americans," adds Holland. The CNN poll was conducted by ORC International, with 381 registered voters nationwide who watched the debate questioned by telephone. All interviews were conducted after the end of the debate. The survey's sampling error is plus or minus five percentage points. A CBS News poll of uncommitted voters who watched the debate gave Biden the edge over Ryan by a 50%-31% margin. Uncommitted voters made up roughly ten percent or less of the debate audience. Ryan won the debate because Vice President Biden doesn't have a winning platform for the last four years and what could he say. If Biden had been more professional and less rude, the debate would have been a tie. But he was a complete turn-off. People are still talking about what an embarassmwnt he would be representing this country. He blew it for the president!! All I have to say is "How is your change working out for you now"? We have had 4 years of this BS. All the changes Obama has implemented has had a negative effect on all of us. It is time for a change, its time for Romney to have a shot. Obama used Big Bird in his campaign adds. Then Tickle Me Elmo showed up for the VP Dabate against Paul Ryan. What Character will we see next?? I vote for Biden. A real poll should have been taken. I can't believe that some Americans still can understand that four couldn't have been a much to resolve the global economical problem of course by wall street banks and the more ten years in Iraq and Afghanistan wars which George W BUSH started that cost America thousands of Billions of $. And what about the banks crises from 2007 that still are affecting the Europe economic and higher unemployment than America's unemployment. I promise American that the Romney & Ryan will not do any better than what President and Biden have done in four years, what George W Bush couldn't do for eight years. CNN is afraid of the Republican it shows. I used to watch CNN but is full of Republican bias especially the Out Font girl. She should work on Fox news . I do not trust them anymore! Every laugh of Biden was a lie of Ryan! Biden won 80:1!!! Today Romney says that Obama does not have any new idea but what about Romney does he have any new idea? or the same idea which put this country in the ditch. Same tax cut and deregulation. Health care reform, GM Chrysler bail out, Dodd Frank bill, pushing for renewable energy, Middle class tax cut, Pulling out of Iraq, and now Afghanistan, Foreign policy with Hillary Clinton as a secretary of state. killing of Osama, and almost wiping out Al Qaeda, Tariff on china's tire.List is very long. How about Romney being rude at the last debate. How quickly we forget. Romney keeps changing his mind l can't keep up with him. If you think Biden was rude wow! All he did was fact checking Ryan. He was the embarass one ! I was embarrassed for Biden. I thought his behavior was not becoming a grown man, let alone one that is tasked with representing his country. How the heck does he ever expect to work together (across the aisle) if he never lets anyone finish speaking, before butting in and shouting them down. As for Ryan, I think it is great that he has a strong foundation in his belief system that is in favor of life. But, I think he needs to think twice if he thinks he should be able to force his beliefs on others, when the answers of what is right and wrong is far from clear, and is largely influenced by one's individual beliefs and faith, which can differ greatly. It's perfect time to make a few plans for the long run and it's time to be happy. I've read this publish and if I may just I wish to counsel you some fascinating things or tips. Maybe you could write subsequent articles referring to this article. I desire to read more things about it! I support obama biden. I am a w.va. coal miner living in Ohio. U.m.w.a. 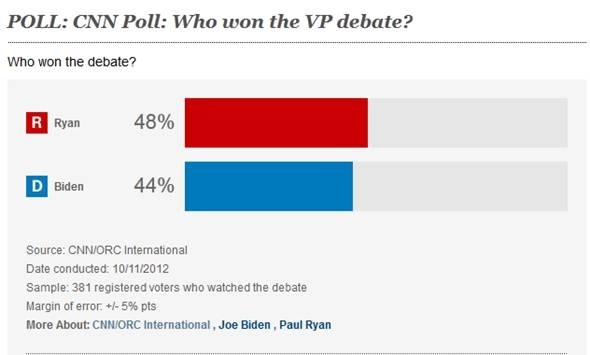 Doesn't matter who won the debate.Obama/Biden = Failed. Make room for the other village Idiot with money,who knows Romney/Ryan could turn things around. For all you republican's who complain about Biden's smiling during the debate – go check out video of Reagan during his debate with Carter, and his famous "there you go agan line" He was smiling and chuckling too. Republican's thought that was so great. Well, Biden just didn't say "there you go again".